For the cupcakes: Line your temp-tations® muffin pan with paper liners. Set aside. Place butter and sugar in the bowl of a stand mixer. Beat until light and fluffy. Blend in eggs, lemon zest, vanilla and lemon extract. Scrape down sides as needed. Add in flour, baking soda, baking powder and salt. Mix on low speed until batter is smooth. Fill each cupcake liner 2/3 full with batter. If using one muffin pan, you will need to bake these in multiple batches. Bake for 22 - 25 minutes or until a toothpick inserted into the center of one cupcake comes out clean. Set aside to cool. For the topping: Spread cream cheese frosting on top of each cooled cupcake. Set aside. Place powdered sugar, flour, water and vanilla in a small bowl. Whisk until smooth. Add more water if needed. Icing should be thick. Scoop 1/2 cup of the icing into a separate bowl. Add a few drops of green food dye and mix well. Cover with a damp paper towel and set aside. Add a few drops of yellow food dye to the remaining icing. Mix well. Pour into a piping bag fitted with a leaf tip. Pull apart the mini Oreo® cookies. Place one half in the center of each cupcake to form the center of your sunflower. Hold your yellow icing bag with the leaf tip touching the edge of the Oreo. The tip should be vertical so you cannot see the "V" of the tip. Apply pressure and pull the bag toward the outer edge of the cupcake, forming each petal. Use more pressure when you start near the cookie and less pressure as you finish each petal. This will give you a point on the end of the petal. Continue making petals all around the top. Once the first row is done, start a second layer, making these petals a little bit smaller than the first row. Remove the leaf tip from the yellow bag and clean it out with a toothpick. Put it on the green bag and pipe two leaves on top of each cupcake, exactly like you did the yellow petals. 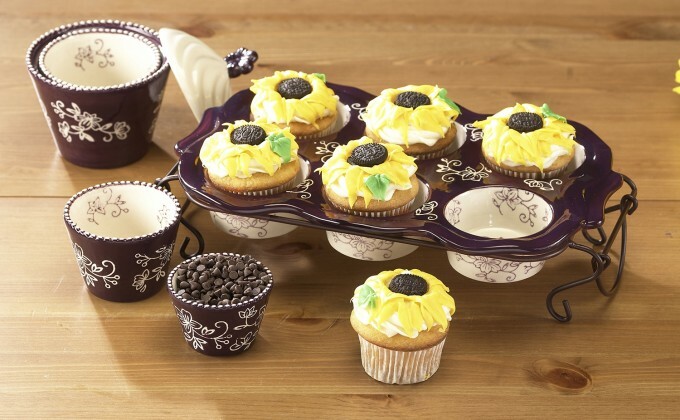 Set cupcakes on a tray to serve.